Summer has finally arrived in Boston and I, for one, couldn't be happier. May was so miserably cold and rainy that stepping out of the house to be enveloped by sunshine today felt like encountering a long-lost friend. I can't wait to smell the honeysuckle flowers on the breeze, hit the beach, sit outside in the warm night with the wind rustling the leaves and eat tomato-basil salads until I explode. And then there is that old favorite, the barbecue. It's true that food eaten outside tastes better. For me, though, the allure of grilling lies not only in the delicious smoky charred flavor but in the fact that grilling is synonymous with cold drinks and good times with loved ones. 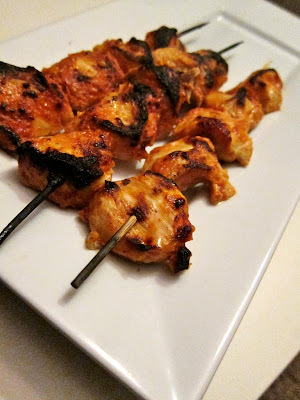 For the next few months, I'll be over here, lining up at the door at any mention of a barbecue, and it'll be with these chicken skewers in hand. Chicken breast cooked on the grill tends to be overcooked, dry and bland, leading most people to go instead for the hamburgers and hot dogs. Not so with this recipe. The key here is to marinate the chicken in spiced-up yogurt for at least four hours which does an amazing job of tenderizing the chicken. Yes, having to plan ahead for the marinade can be a pain but you'll be rewarded with the juiciest, most delicious grilled chicken you've ever tasted. Adapted from here. You can vary the spices: Add some freshly-grated ginger and garam masala or ground cumin and coriander for an Indian twist, or for a vaguely Chinese flavor, replace the spices with fresh ginger and ground Szechuan pepper. The recipe asks for Greek yogurt but I've also made it with store-brand plain nonfat yogurt and it worked just as well. Soak the skewers in water for 30 minutes before putting the chicken on them to prevent them from burning. If you are not able to grill, line the skewers up on a rimmed baking sheet and broil on the top rack of the oven for ten minutes without turning them. 1. Mix all the ingredients except the chicken in a large bowl. Cut the chicken into 1-inch dice and stir into the marinade. 2. Cover and refrigerate for at least 4 and up to 16 hours. 3. Thread the chicken onto the skewers. 4. Grill over medium-high heat for about 10 minutes, turning the skewers midway through. The chicken will be done when charred spots are just starting to appear on its surface.